A collection of books for the library of my future classroom! 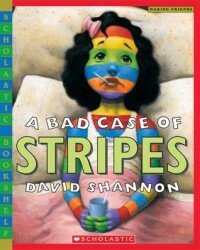 A Bad Case of Stripes is a story about a girl who loves lima beans, but her friends do not. So she says that she also doesn't like lima beans. The next day, she wakes up covered in stripes. As the story progresses and she continues to give in to peer pressure her condition changes and gets more and more bizarre. When she comes clean that she really does like lima beans, she gets all better. This story is great to teach students all about peer pressure, and how it isn't good to judge others for having different opinions. It is a good thing to be different.